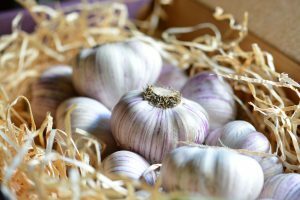 To be kept up to date about our organic garlic and to order online directly from Elmswood Farm please join our email newsletter below. NEWS FLASH : Our 2018 GLAMOUR garlic crop is expected to be harvested in October this year. We aim to have it fully cured and ready for sale to post in late November. There’s no denying it. We’re growing organic garlic here because our after dinner conversations always seemed to end up discussing garlic. So in 2007, we grew our first small garlic crop using our special bulbs. It was such a success we planted more. We knew we had the ideal climate and soil type for producing top quality natural garlic. And the long standing Lucerne paddock in front of the house had just the right nutritional history for the job. Organic Garlic does best when it’s grown through a cold winter and finished off in warm weather. A typical temperate crop. It relies on clear seasonal messages to move from its dormant, growing, and then onto its reproduction stage. As long as there’s moist soil, good drainage and nutrition it will do very well through a cold winter. To create the perfect bulb of garlic, a slow, steady, natural growing pace is needed. It just should not be artificially pushed along with chemical additives and artificial fertilizers. Organic garlic is a very labour intensive crop. 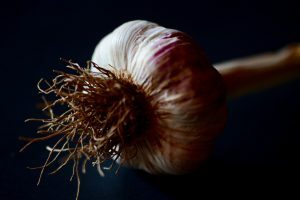 Australia has been swamped by inferior imported garlic as the local garlic industry dramatically declined – it’s the second biggest decline of an Australian horticultural industry after tobacco, (perhaps no great loss.) But unlike tobacco, quality garlic is very good for you. Poor quality garlic is not! Taste Patrice Newell’s ‘Glamour Garlic’, alongside the cheap imported (especially Chinese) offerings and you’ll reach the same conclusion. Yes, it costs more. But it provides much more in quality, flavour and nutrition. Chinese garlic food growing standards and regulations are inferior to Australia’s. All Chinese imported garlic must, by Australian quarantine regulations, be fumigated with methyl bromide. This is to ensure Australia remains free of the 101 bugs and diseases to be found in China. Methyl bromide is a seriously dangerous broad spectrum, highly toxic, sterility agent. As well as being a particularly hazardous chemical for agricultural workers to have to handle, its acceptable consumer safety credentials have been withdrawn in numerous countries, industries and crops over the last couple of decades. Chinese garlic may be subjected to cold and over storage and treated with growth inhibitors to prevent sprouting. So, don’t buy imported garlic! 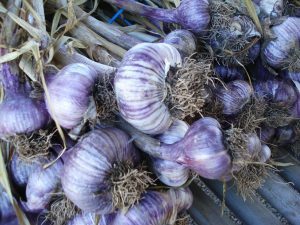 Our garlic business was founded on a special purple variety grown by Graeme Ayton in Victoria. We named this turban variety GLAMOUR. During the last 10 years we’ve tested many different varieties. But most don’t get past my kitchen and friends. In 2017 we’ll be selling three different garlics. We love this garlic because it’s the first to be harvested after winter. This softneck garlic is in the Artichoke group (yes, very confusing as it has nothing to do with artichokes). This is a strong, hot garlic. A little goes a long way when fresh. It keeps better than the Glamour and White, but the cloves are smaller, and it’s never as sweet when baked. The skins are also harder to remove. 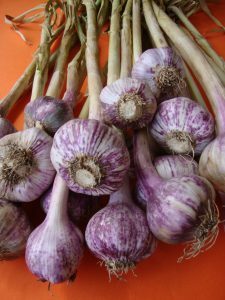 I fell in love with this garlic because the clove size is generous, the skins are easy to peel, but most of all, because it was sweet as sweet when baked and not too strong on the stomach when freshly crushed. The purple colour of the outer skins varies from year to year, for reasons we don’t understand. But the clove skins are always purple/brown regardless. This is a rich, complex not too sulphurous garlic that every kitchen should have in summer. This was first tested when we were doing braids. We thought it was a softneck, but then one year, up popped the scapes. Its shape looks almost identical to Glamour. It’s a creamy white colour with an identical clove formation as Glamour, but it always finishes later than Glamour. Sometimes it develops a pink, soft mauve colour on the outer skins. Clove size is big and skins are easy to peel. Delicious when baked. I store my garlic in a wire rack on the kitchen bench. Garlic when handled naturally will remain dormant and perfect for the entire Summer and well into Autumn. Storage questions have topped our enquiry list. We now know that the best storage of Garlic varies according to regions. If you live in a dry area the best place is out in the open in a well ventilated part of your kitchen. If you live in a humid area, keeping the Garlic cool is best. Too much heat and humidity is death to fresh Garlic. Some refrigerators can be very damp, hence our recommendation to avoid them. And many argue that fridges don’t help maintain the flavour. BUT we’ve had many customers in Queensland tell us that the fridge has been very satisfactory. And I recently saw for myself, a box of our Garlic stored in a domestic cool room in Brisbane and it was 100%. So, I’ve stopped saying avoid the fridge! If Garlic receives full sun everyday in your kitchen it will dry out very quickly. And eventually shrivel up completely. Like all fresh food, it won’t last forever. But it should be perfect all through Summer. As the Garlic gets older, the skins will peel much more easily. This is due to moisture loss. Our Garlic is harvested around the end of October. It is genetically programmed to start re-growing in March- April the following Autumn. So by May, the chances are you will see green shoots sprouting from the top. You can continue to eat the Garlic but the flavour will be much more mild. Of course, we hope you’ve eaten it all before then. We appreciate hearing any information about storage, so please let us know if you’ve found a better way to keep this valuable food.